This series has a strong vintage influence, with colours and motifs reminiscent of the Victorian era. The Victorians liked to combine very fine details with dark rich colours. 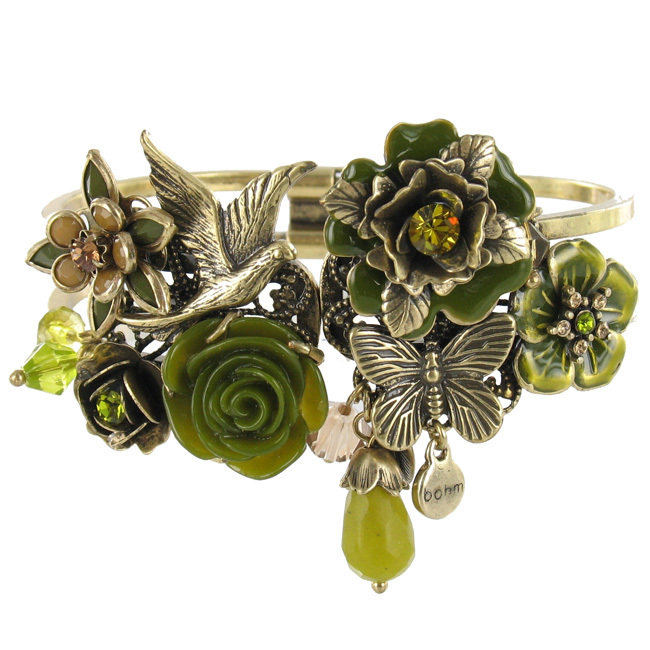 The various items available combine butterflies, flowers and foliage with burnished metal finishes, resin and enamelled flowers, Swarovski crystal and crystal beads in antique colours. Available in vintage gold with shades of green. Stunning corsage brooch. Featuring a cascade of charms and beads. These items are incredibly detailed. It measures 12cm/4.75 in total length by 4.5cm/1.75 inches width. Traditional back pin with over-catch. Pretty interwoven necklace with clusters of charms, faceted glass beads and Swarovski crystals. These items are incredibly detailed. The necklace is adjustable and measures 40cm/16 inches to an adjustable 48 cm/19 inches. Pretty flower detail earrings with a beaded tear drop frame from which hang chains, beads and charms. These items are incredibly detailed. They measure 8cm/3.25 inches in total length. French clip fastener for pierced ears. Hinged cuff with a 'vintaged' patina finish. Featuring an eclectic mix of faceted crystal shapes and beads, pretty enamelled flowers, leaves and a butterfly and bird motif. It measures 3.5cm/1.5 inches wide at the front. Diameter 6.5cm/65mm. This bracelet consists of interwoven multiple chains and leather cord with a mix of chains, flowers; butterfly; bird; leaves and faceted glass and Swarovski crystal beads. The various beads and charms measure from 5mm up to 1.5cm/15mm. The length is adjustable and measures 19cm/7.5 inches to 23cm/9 inches.